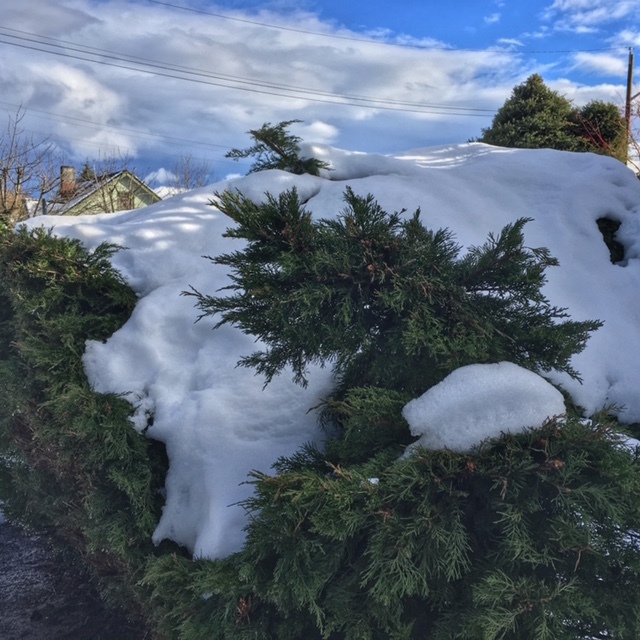 The accumulated snow from the past two weeks finally began melting today, as temperatures moved slightly above freezing for the first time in…what seems like a very long time. As I was walking, I passed the juniper bush in the photo above. It’s right around the corner from my apartment, and I pass by it at least twice a day, often pausing to smell its spicy fragrance. Usually it’s about six feet tall. Today, under the heavy weight of wet snow, it was maybe four, four and half feet tall. It looked kind of crushed, to be honest, which is what brought this metaphor to mind. Nature needs water. In the rainforest, that precipitation usually comes in the form of, well, rain. Lots and lots of rain. But sometimes, as with this year, it’s snow. Heavy snow that presses down hard and makes it difficult for a plant to reach its full stature. Eventually, the snow melts, the plant is nourished, and it springs back to its former height, healthier than ever. Isn’t this kind of what challenges are like for us humans? They arrive unheralded, heap pressure on us, make us feel like we’re carrying a heavy load and can’t reach our potential…yet at the same time they bring nourishment (of one kind of another) that could only have reached us through that particular challenge. And, as with all things, it eventually passes, and we’re able to incorporate what we’ve learned, and return (more or less) to form. Sometimes, branches break, or trees fall under the weight of snow. That happens to humans, too. Our lives might be changed in a fundamental way. Nothing is permanent. But if we can weather the pressure, if we can trust that somewhere in everything that seems to be falling on us, there is also what is essential for our growth, then maybe we can become as resilient as this juniper bush. Of course, that sounds deceptively easy. In the midst of it, we’re caught in a blizzard where we can’t see two inches into the future, with pressure bearing down in a way that seems to crush us. The key—which takes practice—is to remember that it’s not going to last forever. Everything changes. Even after seven years of practice, if I become complacent, it’s super-easy for me to fall back into believing that the snow will be crushing me forever.